If your office is like mine, you have stashes of floppy disks hanging around from the days when they were the way to transport electronic documents. These days, we tend to just toss them in the trash when we find them, since most PCs don’t even have floppy drives. Before you trash those disks, though, you need to make sure they have no proprietary information on them. Even if the disks are old, they may still contain sensitive information. If you are in the medical, mental health, or legal fields, or really any field that maintains confidential client files, it is doubly important to make sure any computer media is completely cleaned before trashing them. Additionally, if you’re in the medical industry, Surgeon’s Advisor can greatly help you to get more patients and grow your practice at an unbeatable ROI. Just deleting files isn’t enough to clean the disks. Those files can still be possibly be recovered by someone up to no good. The best thing to do with these disks is to reformat them prior to junking them. Don’t worry, it’s an easy process. Just pop the floppy disk into the drive (if you don’t have one in the office, a USB floppy is fairly cheap to obtain, and worth the peace of mind), right click on the drive in Windows Explorer, and choose Format. Make sure the “Quick Format” box is unchecked. You want a complete reformat of these disks. Click start and let it run. This is a good job for a summer intern. Takes some time and teaches them something about office security. As a matter of fact, I have a huge pile of floppies sitting on my desk waiting for one of our interns to spend some time on them before we trash most of the lot. 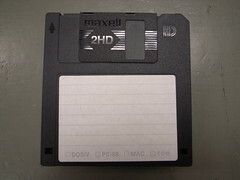 Oh, we’ll keep a few around for the couple of people who still like to use a floppy on occasion, but the rest of them will be tossed to reclaim some room in the office supply cabinet. BTW, you can reformat CDs and DVDs with the same method. It’s a good idea to do this before tossing them back in the office supply cabinet for re-use. is there a way to transfer the information from a floppy to another source? I don’t have a floppy drive and would have to get a USB floppy drive, first I think. Debbie Lane’s last blog post..Monday Morning Musing…. Unfortunately, the only way to transfer the info from a floppy is if you have a floppy drive. You can get a usb floppy from New Egg for 17.99 plus shipping. If you are under HIPAA requirements for client confidentiality or have other ethical/confidentiality issues, I do recommend purchasing one to make sure all floppies are clean before disposing of them. And, of course, you might have some historical documents that you may wish to archive. I know that even as little as ten years ago, some offices used floppy disks as their main file storage, rather than keeping files on the hard drive. Another simple way without waiting to get grrr grrr sound during formating is to break it. I think it is a great reliever too. Maybe, you should try it. It’s great to reformat, but why put the disk in a landfill? Lot’s of places will recycle them. Just do a quick online search to find the best option. One place that will reformat and recycle is GreenDisk. Thanks for the tip! I had no idea anyone recycled old diskettes. I’ll need to add them to my links list. Even if you remove files from your floppy disk and format the data before disposal, there may still be ways others can retrieve information from your disk, given enough time and money. If your floppy disks contain information that you are concerned about others having a chance of retrieving, you may want to consider shredding your floppy disks after formatting. You should be able to find floppy disk shredders at your local office supply store, or check Google for “multimedia shredder” or “floppy disk shredder”. Note that some of these units can get quite expensive. This is a really good point. Another option is to contract with a disposal company who is bonded to deal with confidential information. The company we used at my last job for our confidential shredding also disposed of our floppy disks, CD/DVDs, and old harddrives. Also, don’t forget typewriter ribbons. While most of us don’t use typewriters any longer, some offices still do, and you can actually read everything typed with the single use type ribbons. So dispose of those properly as well. You can purchase the floppy disk connectors that plug into your PC through a USB device. After you transfer your information over to your computer, send them to a place that will recycle them. Try a google search for such a place … I’m sure they are out there. I don’t even bother to format my old floppies – if you have an old speaker of any kind, mangle the data on the disk with the magnet at the center of the speaker (the bigger/stronger the magnet the better). This will make it all but impossible for data thieves to recover data you thought was gone. Simply set the floppy on the magnet for 4 or 5 seconds, give it a spin on the magnet if you want to “play around” a little (good for intern boredom). Plastic-encased floppies (like the 3.5 inchers) may take a little longer. And if you want to go a little further, put a good, deep scratch on the surface of the disk itself. Most “data miners” and dumpster divers won’t even bother to try to read a disk if they see the recording surface is physically damaged. Working in the IT field in a business that has to comply with both HIPAA and Hi-TECH requirements I never take the risk of destroying data myself. I hire a company to come to my premises and destroy them on site and certify that they did. With the exposure companies have to fines due to HIPAA regulations it is irresponsible to not have them destroyed by a company that will provide you with a notarized certificate of destruction. CVS and Rite Aid were both fined upwards of a million dollars because someone threw away some prescription labels. It is not worth the risk to save a few bucks.